You use workflows to automate key business processes, and it’s critical for you to understand if your workflows are working successfully or running into errors. If you had a large workflow with many actions, it could be hard to scan the workflows history page and understand what was working and what was not. This would add a ton of friction if you were trying to track down the source of an error. Today's updates were made to remove that friction and empower you to better understand the actions in your workflows. The new column makes it very clear which action corresponds to the event, and whether or not it executed successfully. For example, if you are trying to see if the emails in your workflow are getting sent successfully, you can use the new filter to only see the history events for "send email" actions. 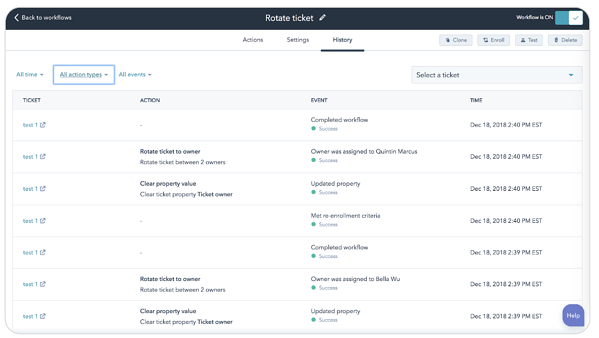 To get started, all you have to do is go to a workflow that has enrolled any objects and click the “history” tab to see the new column and filter options. These new features are currently available in all deal (Sales Hub Professional or Enterprise users), ticket (Service Hub Professional or Enterprise users), company (Service, Sales, or Marketing Hub Professional or Enterprise users), and quote-based (Sales Hub Enterprise users) workflows. It will come to contact-based workflows in the future.